Withhold not Thou Thy tender mercies from me O LORD: let Thy lovingkindness and Thy truth continually preserve me. He keepeth the path of judgment, and preserve the way of His saints. And thou shalt speak My Words unto them, whether they will hear, or whether they will forbear: for they are most rebellious. But thou son of man, hear what I say unto thee; Be not thou rebellious like that rebellious house: open thy mouth and eat what I give thee. And when I looked, behold, a hand was sent unto me; and, lo, a roll of a book was therein; And was spread before me it was written within and without; and there was written therein lamentations, and mourning, and woe. And He said unto me, son of man, stand upon thy feet, and I will speak unto thee. And the spirit entered into me, when He spake unto me, and set me upon my feet, that I heard Him That spake unto me. And He said unto me son of man, I send thee to the children of Israel, to a rebellious nation that hath rebelled against Me: they and their fathers have transgressed against Me, even until this very day. For they are impudent children and stiffhearted. I do send thee unto them; and thou shalt say unto them, Thus saith the Lord GOD. And Jesus answered him saying, It is written, That man shall not live by bread alone, but every Word of God. 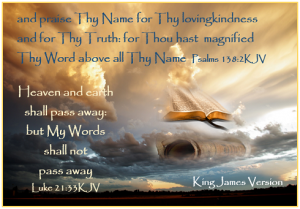 Being born again, not of corruptible seed, but of incorruptible, by the Word of God, Which liveth and abideth for ever. For all flesh is as grass, and all the glory of man as the flower of grass withereth, and the flower thereof falleth away: But the Word of the Lord endureth forever. And this is the Word Which by the Gospel is preached unto you. For the Truth’s sake Which dwelleth in us, and shall be with us forever.